Hitting the ground running this week -- in heels no less -- so for the next coule of days, I'm all about some of my basics mixed and matched. That means a lot of silk button front blouses and pencil skirts. But that doesn't mean we can't play around with some patterns, right? Gotta keep things interesting, after all! Hope you're all having a fabulous week so far! Love the mix of prints. I'm always so scared of mixing them, but this looks great. I really need to stop being a wuss and try it already. Necklace, skirt and bag are awesome!! you mix patterns so well! love your skirt!!! super cute tote too! I trully like the mix of differetnt prints. I love fooling around with pencil skirts and patterns, it makes for a totally appropriate and elegant outfit! Mixing patterns, love that concept! You executed it very well. 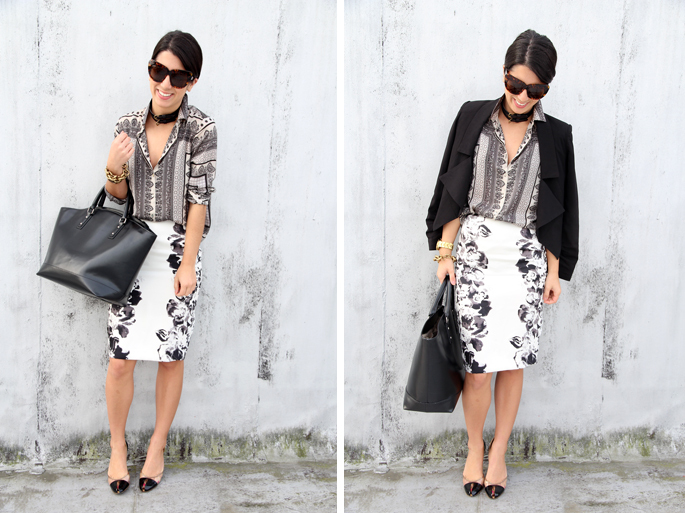 The prints look great together; in a classic way since they're both black & white! Such a gorg and sophisticated mix. love this mix! fantastic outfit! Such a great outfit! Love the unexpected choker necklace. Totally fabulous as usual! Your combinations of patterns is stunning and so are you! You're a walking ad for Zara! I love it! Love all the print mixing! I love the prints! Pretty! Adore the mix of prints! In love with the shirt and the skirt! Love the play on prints and the shoes are gorgeous! I had a pair like this in college and am kicking myself for selling them to consignment (c'est la vie). Happy Tuesday! I love Zara! A perfect combination of prints! Love the prints together. Zara is amazing! The mixed prints look great, loving the shoes!! You mix those patterns brilliantly! Basics are the best when you pair them correctly! You look very chic! Love the monochrome print, Such a chic look! i love that you wore a bracelet as a choker! cute! Love this look! The print on print is so fab! Gorgeous combination! I'm in love with your shoes! MARC by MARC JACOBS RING GIVEAWAY! Don’t miss it, it’s a big one! I screamed a little when I saw this outfit!! Mixing the patterns like a champ Ms!!! First time on your blog and totally loving it! Hope you are having a wonderful day! Love the mix of prints here and the bracelet as a necklace. This look is quintessential you. So gorgeous and comfortable. LOVE that blouse! super cute! Sadly the skirt doesn't fit as their sizes run small. ooh this is my fave look, chic and fresh! Yay, another black & white combo. Love it! I absolutely LOVE the print of this blouse! So pretty! And those sunglasses are amazing on you, I've been eyeing them too! I'm loving the mix of black and white prints here! What a great mix! I want to head back to my closet and see what black and white prints I can pull together now....very cool. This is a great mixing of patterns. What a great fun, but professional look. Love it! BAM. Pattern mix=phenom. Love the b&w palette. one more quick confession- I also bought these cap toes zara shoes because of you! love the mixing of the two patterns! so chic!